It only takes about 4 minutes to read this page. Tx is a simple yet powerful translation and localisation library for .NET applications. It manages a dictionary containing all the text snippets and phrases you need, for multiple translations. If a translation is not available in your preferred language, it can be looked up from other languages. Texts can also contain named place-holders that are filled with your data at runtime so that you don’t need to concatenate all the parts yourself in the right order. Localisation tasks like typography, number or time formatting according to the local standards are also covered. A special feature of Tx dictionaries is that each text can have different translations depending on the subject count you’re talking about, also called pluralisation. One day is a different word than two days. This allows you to speak to your users in the most natural way, avoiding ugly parentheses or alternatives for plural words in the user interface. All texts and translations are stored in an XML dictionary file, one per project. This XML file usually contains all languages. The dictionary can be installed with your application, or compiled right into it as an embedded resource. The TxLib library can be used from any .NET application and is the part you’ll distribute with your application. For more portable applications, you could also directly copy the class files into your project – it’s only a few files. Its main class, Tx, is further described in the documentation. All texts are associated with text keys. A text key is a short string that uniquely identifies a text or phrase and is usually used in the application source code to refer to a specific text. Text keys can be freely assigned by the developer, but there are some structuring guidelines described at the end of the documentation and a few additional requirements when using the TxEditor tool. The .NET framework uses the concept of cultures to specify a combination of language and data formatting rules. Each culture has a code that describes the language and optionally a region. There are more variants but they are not supported by TxLib. Examples are “en” for the English language, “de-DE” for the German language in Germany or “pt-BR” for the Portuguese language in Brasil (as opposed to Portugal which many would probably first think of). TxLib uses these cultures to identify translations and both, region-specific and language-only codes, are used where the latter ones always serve as fallback if a translation is not found for a specific culture. The TxTranslation solution also comes with a graphical translation file editor that provides all the functionality for translating personnel that don’t necessarily have any programming experience. 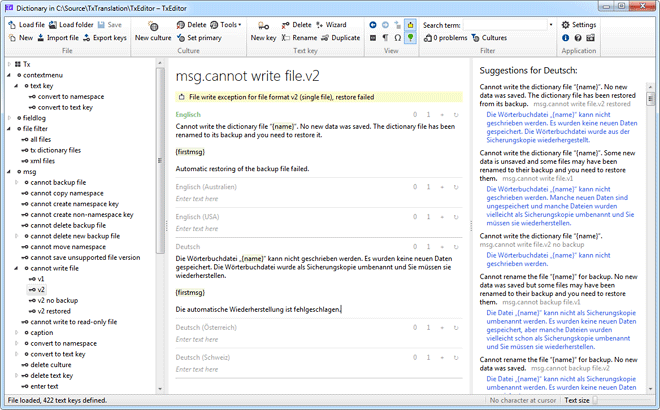 The TxEditor application can load a dictionary file, list all the text keys that it defines and allows viewing and editing the translation texts. It performs consistency checks to point the user to potential errors and highlight missing translations. TxEditor also makes use of TxLib itself so it is fully localisable and can be used to translate itself into other languages. The following C# example shows several usage possibilities of the Tx class. The following XAML example shows several usage possibilities of the WPF bindings. The documentation (docx and pdf in the code repository) describes the TxLib methods usage as well as the TxEditor application more detailed. Note: Releases after 2016-01-09 are no longer digitally signed because there are no more free code signing certificates available for open source developers. A commercial certificate from 200 € per year doesn’t pay for me. I’m sorry for the confusion this may cause with your next download. This package is also available through NuGet. That way, it can be integrated and updated in a Visual Studio project very quickly. This package only includes the TxLib assembly for .NET 4.0. For installing TxEditor you need to download the setup program above. TxLib and the dictionary file format are now considered stable but little tested yet. There are plans for future additional features but no API change. TxEditor is still new and also incomplete. Some indicated functions are missing or stop working in some conditions. The user interface is not yet rock-solid or even very clean. This is currently being improved. The documentation is almost complete, but some sections about unfinished parts in TxEditor are also missing. The source code reference is not ready for the public yet, use the inline comments through IntelliSense instead (original source code or .xml file). First log entry in this file. For a full list of changes please refer to the Git repository commit history. The TxLib library, which is used in applications, is released under the terms of the GNU LGPL licence, version 3. The other projects (TxEditor, demos and converters) are released under the terms of the GNU GPL licence, version 3. You can find the detailed terms and conditions in the download or on the GNU website (LGPL, GPL). Created on 2013-07-01, updated on 2016-01-26.